Touching a piece of history can be a compelling experience, especially when that piece of history exhibits great beauty and luscious scent. The roses growing and blooming along the roadsides, in gardens and in the cemeteries of Gold Country in the Sierras are precisely that. They interlace two phenomona of the nineteenth century: the California Gold Rush and the burgeoning rose nursery industry. The nineteenth century saw an amazing growth in rose breeding comparable to the tulip frenzies of Holland centuries before. Near the turn of the 19th century four stud roses had been introduced from China that revolutionized thinking about roses. The Asian roses bloomed continuously; unlike European roses which had one bloom season. The Chinese were always more interested in peonies and chrysanthemums than roses, but they knew a good thing when they saw one and grew many natural hybrids in their gardens. As the European influence in Asia grew, many plants were brought back to England and France. Breeders there crossed the new Asian roses with the once-blooming roses and new classes of roses were established. These new classes, developed from the tea and china roses of Asia, combined attributes of both parents. The Asian roses contributed the ability to bloom continuously as well as the colors of red and yellow. The European roses gave hardiness and sometimes shape and scent to the flowers. Many new cultivators were developed to sate the eagerness of the new bourgeoisie to gentrify by possessing the latest in roses. Where does California come in? And, in particular, the number of roses in the Gold Country? In 1849 gold was found near Sutter’s Mill. The foothills of the Sierras flooded with fortune seekers. The resulting boom created many rich people who wanted their homesteads planted not only with the old familiar plants of home, but also the new continuous-blooming roses being developed by the French and the English. Nurseries such as A.P. Smith’s in Sacramento imported them into California almost as fast as their hybridizers could grow them. The rose and California are perfectly suited to one another. Privileged by the climate, the flower grows consummately well in the glorious California sun. When the gold mines spluttered out and the miners flushed out of the gold country leaving behind homesteads, tools, mine tailings and tin cans, the roses remained, growing well and happily without their human companions. Roses, a long-lived perennial, will grow until some insult curtails their existence. In some cases old families remained, tending their beloved flowers and passing their land down in the family. Craig Martin, rose curator of The Huntington Botanical Garden in San Marinaro, CA, explains that the impoverishment of the area due to loss of income from the mines probably saved the roses. If the families had had more money, they might have dug the old roses up and replaced them with new varieties. Thousands of roses were brought into commerce in the nineteenth century just as they are today. 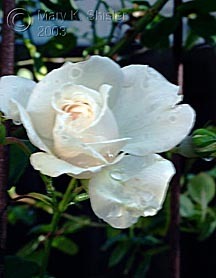 Not all became best sellers and nursery people make short shift of a rose that does not produce a profit. Many fine roses and some not so fine found their way to the compost heap as fashion changed people’s fancies for rose types. Old favorites such as Charles de Mills, Madame Plantier, La Reine, and many others still grace today's gardens and claim their champions. But in some cases the original cultivor was lost and their descendent(s) became mystery roses. 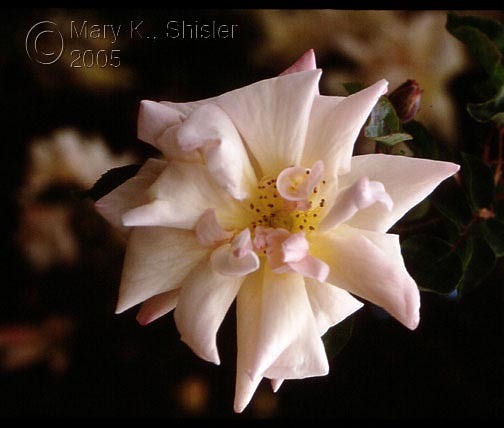 Many rosarians feel that some mystery roses may be accounted for by early rose distribution habits. Seeds of hybrids rarely grow true to the parent plant and many people would pass seeds of their favorite rose along to family and friends to share. Roses also change greatly in the size of the plant, and color and fineness of bloom, depending on the soil and climate in which they are raised. For example, according to Martin, the fine English rose, Graham Thomas, rarely attains five feet in its native England but in the Huntington Rose Garden can barely be restrained to 12 feet. Once, on a trip to New Zealand and Australia , he found many familiar favorites unrecognizable because of the different growing conditions and soil. Roses are as individual as people. Some will fare well with moderate shade and others need optimal sun and soil conditions before they will grow to perfection. All roses are given a name when they are brought into commerce. Even though Shakespeare intones that a rose by any other name would smell as sweet, he spoke in botanical ignorance and well before the proliferation of cultivators from the nineteenth century forward. Some roses find more than one name, which makes for confusion. However, a gardener needs to know the rose they have acquired is precisely that particular rose. Without that assurance, one doesn’t how the plant will perform in a garden or how the blooms will look and occur. Consequently, correct nomenclature and identity become crucial. This has sometimes left mystery roses out in the cold. The ability of these plants to survive in less than optimal conditions recommends them. However, their rarity makes them difficult to acquire, even though some nurseries such as Vintage Gardens in Sebastopol, California and The Antique Rose Emporium in Texas have made extraordinary and notable efforts to bring these roses back into commerce. Gregg Lowery of Vintage Gardens feels the best reason to raise a rose is because of its intrinsic beauty and mystery roses provide ample motivation for their cultivation. Rose rustlers scour the countryside and cemeteries in search of old roses. The hills of the Sierra piedmont have been a treasure trove for years. Many of these rosarians belong to groups such as the Heritage Rose Group and its local branches. By collecting cuttings from the roses and growing them, they protect these roses from extinction. They also attempt to identify the roses. 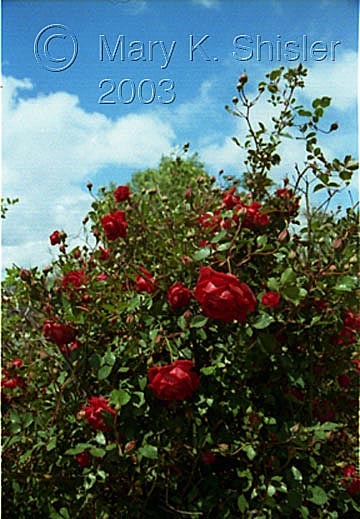 Public collections have been made of these roses. The San Jose Heritage Rose Garden in San Jose holds many. The Sacramento Old City Cemetery is also a repository garden for roses as well as for California native plants. The best way to correctly identify a rose is to grow it alongside its possible namesake in the same soil conditions and climate. Both of these gardens as well as Gregg Lowery and Phillip Robinson of Vintage Gardens work on the actual identity of these cultivars. Though it is unlikely the identity of many these roses will ever be known, there are success stories. Recently, a most beautiful and fragrant, pink hybrid tea, called the “J. C. Flat Pink,” has had its identity confirmed as “September Morn” at the San Jose Heritage Rose Garden. How to find these mysterious windows to the story of Gold Country? One of the best ways is to follow the serpentine path of Highway 49. In the north part of the highway Nevada City and Grass Valley have many roses growing. A visit to the cemeteries is de rigeur. Not only do roses grow, but so do other plants—and the old gravestones never fail to fascinate the viewer. Placerville, 44 miles east of Sacramento, is the approximate center of Gold Country. 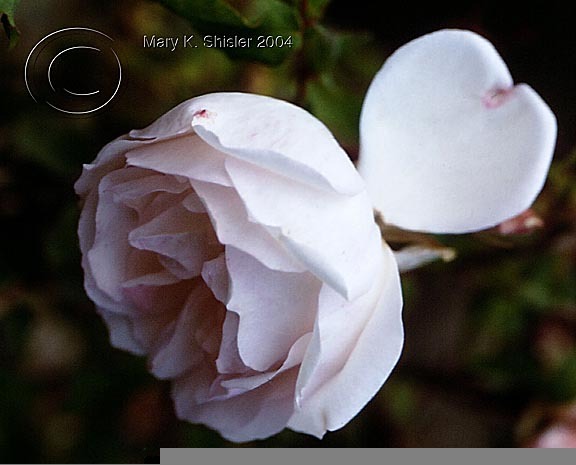 Its cemetery has many beautiful roses, including the Placerville White Noisette (also known as Legacy of Jacob Zeiss). To the south in Angel’s Camp Cemetery, nodding roses cover the graves from the last century and a half. This cemetery as well as many in the Gold Country tell the story of rose breeding in the nineteenth century. Fine examples of the great classics of the rose world such as Louis Phillippe, an early China rose, and La France, the first hybrid tea, grace the cemetery, as well as many mystery roses. Roses bloom here that exist nowhere else in the world. Nearly deserted old mining settlements such as Fiddletown, with its enormous fiddle over its hall and historic Chinese apothecary, have many roses and offer riches of interest to the visitor. Fiddletown is the home of the Fiddletown Cherry Noisette, along with modern-day gold panners. The largest problems for these roses today is perpetual care in cemeteries and the population growth in the region. 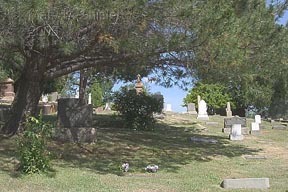 Cemeteries, due to budget constraints, need to tend to the grounds in the least expensive way possible and mowing around roses or watering them adds to their costs. Due to the population growth, a great deal of land in the Sierras is being built up. When people purchase a home, they often remodel or paint and in doing so “scrape” the landscape and destroy the roses—little realizing that the old plants around the home are as old the homestead and bespeak as much of its character as its architecture. The best time to see the roses is from April to May, depending on the severity of the winter in the piedmont. The further north, the later the bloom. Spring in the Gold Country is extraordinary. Not only are the roses blooming, but California poppies and blue lupine add to the luscious color. Drive carefully, savor the sights and stop to smell the roses. Legacy of Caterina King is an old mystery rose found in Georgetown Cemetery. Red roses reach for the sky in Angel’s Camp Cemetery. The Nevada City Yellow Noisette has lovely yellow flowers and grows to be a rather large climber. The Placerville White Noisette aka Legacy of Jacob Zeiss in the Placerville Union Cemetery. Zeiss, a German immigrant, died in 1890 at age 25. The rose is quite hardy, disease free and blooms with the generosity one expects of noisettes. The Angel’s Camp Tea blooming in the author’s garden. 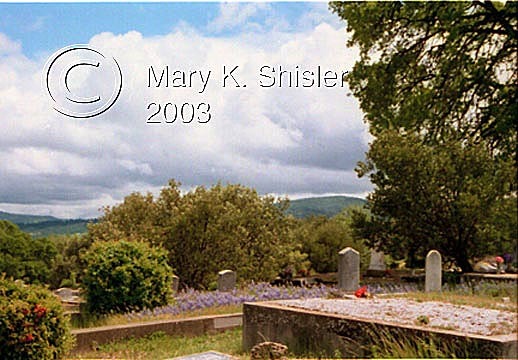 Situated on a rise, Angel’s Camp Cemetery affords a view of the surrounding area. Blue lupine bloom freely.